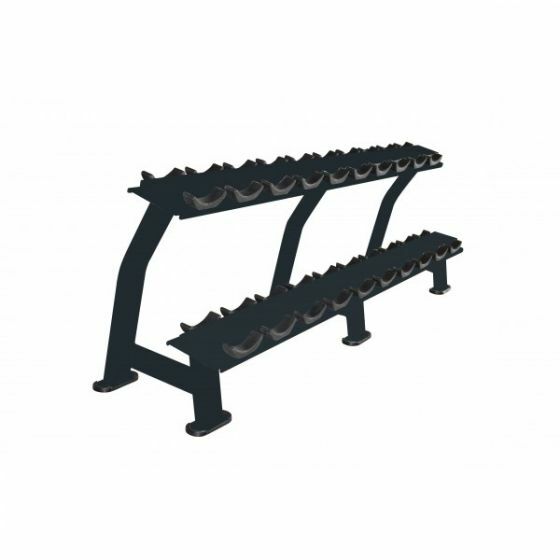 Great heavy duty dumbbell rack that is designed specifically for the Primal Strength Stealth Dumbbell range. With the ability to take up to 10 pairs of Neo hex dumbbells you can safely store a complete set to help with identification and keep your gym floor clear. A heavy duty, stylish storage solution for all your neo hex dumbbells. With the hardened plastic saddles to help keep the dumbbells in place this rack whilst designed for the stealth series from Primal Strength would be suitable for other hex dumbbells. Not just for safety, but storing your dumbbells on a horizontal rack ensures you can quickly and easily find the weights you want to work out with. This commercial rack is designed specifically for the Primal Strength Stealth Neo Hex dumbbells and is stylish with it's matt black finish.